This article by Bernardo Batiz-Lazo, Professor of Business History and Bank Management, Bangor University was originally published on The Conversation. Read the original article. Queen Elizabeth II gets a tutorial. : Lloyds Banking Group Archives , Author providedThese events fired the starting gun for today’s self-service banking culture – long before the widespread acceptance of debit and credit cards. The success of the cash machine enabled people to make impromptu purchases, spend more money on weekend and evening leisure, and demand banking services when and where they wanted them. The infrastructure, systems and knowledge they spawned also enabled bankers to offer their customers point of sale terminals, and telephone and internet banking. Ready cash? You can bank on it.A number of factors made this ATM explosion possible. First, sharing locations created more transaction volume at individual ATMs. This gave incentives for small and medium-sized financial institutions to invest in this technology. At one point, for instance, there were some 200 shared ATM networks in the US and 80 shared networks in Japan. 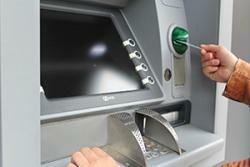 ATM design began to accommodate people with visual and mobility problems, too. And in recent decades, many countries have allowed non-bank companies, known as Independent ATM Deployers (IAD) to operate machines. 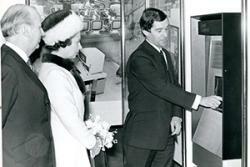 The IAD were key to populating non-bank locations such as corner shops, petrol stations and casinos.